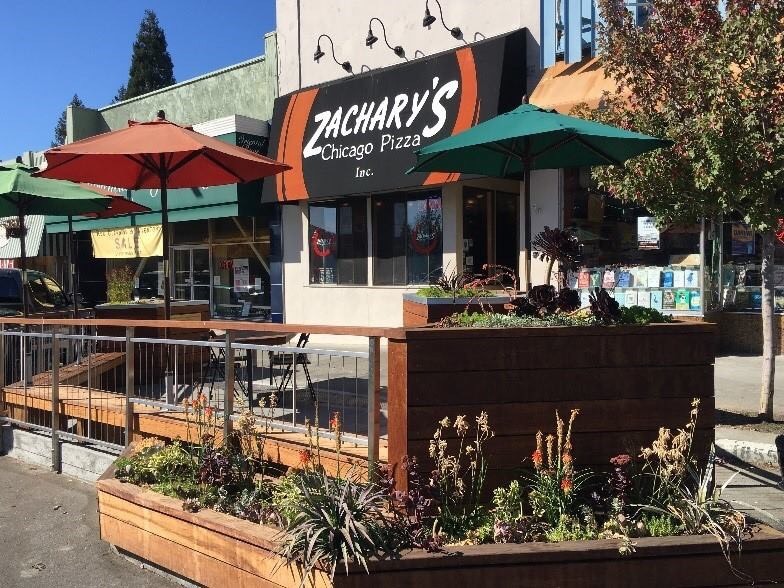 Berkeley will be celebrating the opening of its newest parklet with a special a ribbon cutting on Friday, Oct. 27th at 4:30 p.m. at the parklet, which is in the 1800 block of Solano Avenue in front of Zachary’s Pizza and Pegasus Books. The parklet was built as an Eagle Scout project by17-year-old Emmet Hegarty, a scout in Berkeley Troop 6 and senior at Berkeley High School. Studio Bergtraun Architects helped design the parklet and worked with Hegarty to accomplish this big project. The parklet was seeded by a grant from UC Berkeley’s Chancellor’s Community Partnership Fund designed to inspire community-campus partnerships for neighborhood economic development and funded by community donors as well. Both Emmet Hegarty and Alex Bergtraun will be on hand for the ribbon-cutting, as well as the parklet’s host merchants, Zachary’s Pizza and Pegasus Books,city and university officials and boy scouts from Berkeley’s Troop 6, which provided the labor.